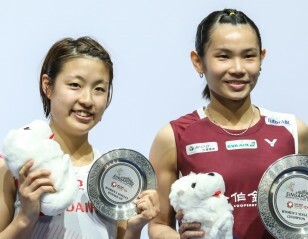 Women's singles winner Tai Tzu Ying (right) and runner-up Nozomi Okuhara. 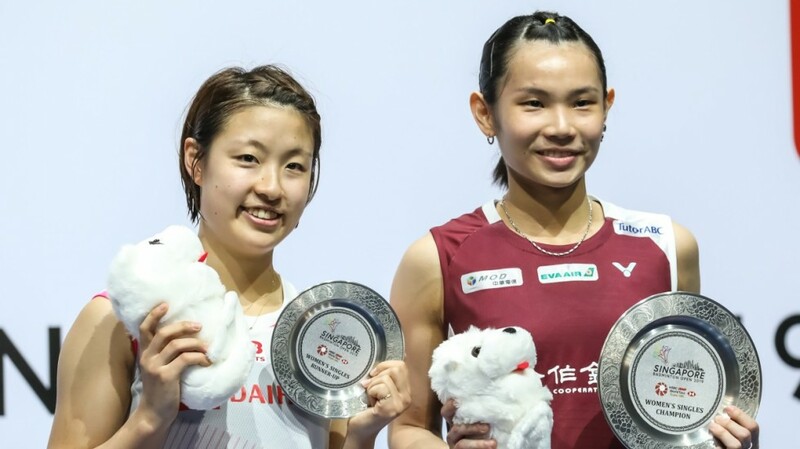 Kento Momota and Tai Tzu Ying captured their second Singapore Open title today in contrasting styles. 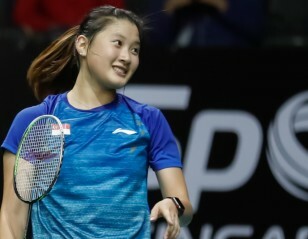 While Momota had to battle it out for over an hour against Anthony Ginting, 10-21 21-19 21-13, Tai closed out her match against Nozomi Okuhara in 41 minutes, 21-19 21-15. Ginting threatened to run roughshod over Momota as he blitzed the All England champion in the opening game of the men’s singles final, with Momota struggling to counter his opponent’s speed and sharp smashes. Ginting continued to pour on the pressure in the second, but Momota starting anticipating the attack better, and with the rallies getting longer, the Indonesian started to feel the exertion. Momota caught up from 11-16 down; the end of the game saw a great rally in which the Japanese stubbornly defended a series of smashes to go up 19-17. Once he had taken the game, the momentum shifted Momota’s way, with Ginting unable to maintain precision on his smashes and Momota’s percentage game helping him establish a stranglehold on the proceedings. Tai won her second World Tour title in two weeks, subduing Okuhara in the women’s singles final. It was a near-flawless performance from Tai, who, unlike her sometimes playful self on court, brought a degree of ruthlessness to bear today. It was a businesslike approach from start to finish, and it gave nothing for Okuhara to work with. The Japanese did little wrong. She had her running shoes on and chased every shuttle; she erased deficits in both games. But Tai’s greater shotmaking ability helped her create openings were none existed, and her control was so good that several of her lifts to the baseline landed unerringly on the line, causing Okuhara to look despairingly at her coaches. Tai Tzu Ying put in a flawless performance. “She was speedy and skilful, so I had to be cautious. Her timing is so good. She kept me waiting on every shot. She put a lot of pressure on me and I made a lot of mistakes,” said Okuhara. Tai shrugged off the enormity of her accomplishment. “It has been long since I played Okuhara. She isn’t easy, she’s great at running, so I had to be prepared for a long match.